While I have already posted a couple of salad recipes so far, I feel it is truly necessary to share my latest salad invention with you. With cooked kale as the star of the show, my Sweet n’ Savory Salad will warm your soul and satisfy you with every bite. I’ve noticed that the mason jar salad thing is all the rage these days, and I definitely can’t knock it until I try it. But in the winter months, I tend to opt for loads of roasted veggies, gooey cheese, and toasted nuts. My Sweet n’ Savory Salad is surprisingly simple to prepare, and only requires a little bit of baking and toasting that you can always do ahead of time. It also makes a perfect starter or can stand alone as a meal (feel free to add a protein). I made it for dinner recently, and I felt like I was eating at a fancy restaurant. It’s that good! 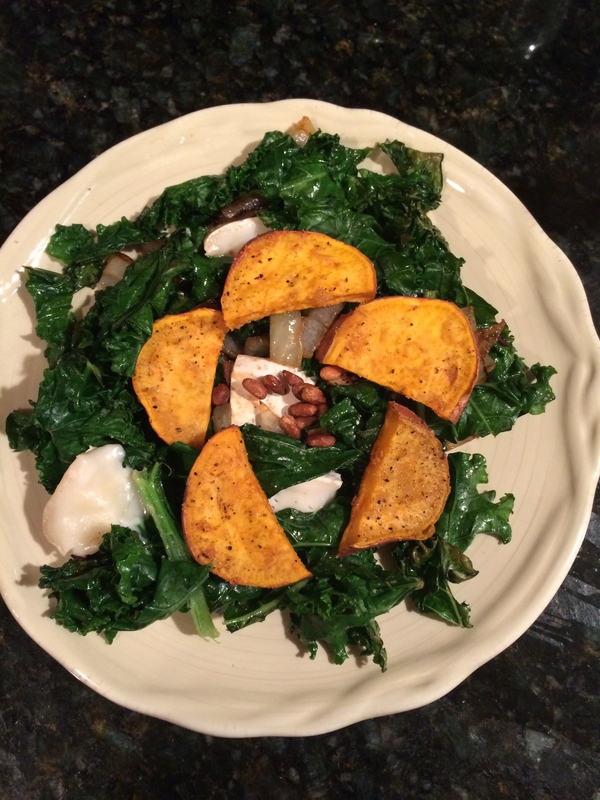 Chat with Coneys and Kale: Would you make any changes to this recipe, or leave it as is? Share your opinion here, or on Facebook, Twitter, or Instagram @coneysandkale! 2. Place sweet potato slices on a greased baking sheet and coat slices with olive oil. Season with salt, pepper, or seasonings of your choice. Bake for 20 minutes or until golden brown. 3. When potatoes are done, add pine nuts to baking sheet and toast for about 3-5 minutes/until golden brown. 4. In a pan over medium-high heat, add about 2 tbsp olive oil. Sauteé onions until lightly golden. 5. Add kale to pan until it is cooked to the consistency of your liking (I like mine a little on the crispy side). 6. Turn down the heat slightly and add brie segments for about 2 minutes until slightly melted. 7. Arrange all finished ingredients on a plate as desired. Serve with dressing of your choice! Wow – this really looks great. Now if I could just convince someone to make it for me!